Are Your Morning Headaches Telling You Something? If you can’t link the thumping in your head to a big night watching the All Blacks, it might be your body’s way of trying to tell you something. As soon as you emerge from your slumber, you should feel rejuvenated and well-rested. If a headache is literally the first thing that pops into your mind, you should be assured that a headache is not a normal way to start your day! Headaches, specifically the ones that hit as soon as you wake in the morning, are a very common symptom of sleep apnea and other sleep disorders. People who have sleep apnea without treatment can experience headaches in the morning due to the strain the condition puts on your body and the interrupted sleep. Sleep apnea partially or completely blocks your airway during sleep, meaning the amount of oxygen being transported to your brain is heavily reduced. As well as those nasty morning headaches, this lack of airflow can also put you at risk for serious conditions such as high blood pressure, heart attack and stroke. If you’re not raring to go and seize the day when you wake up because a hammering headache is setting you back, it’s likely time to seek professional advice. Thankfully, there are a range of treatment options available and you’ll be waking up with a clear mind before you know it! Often wake up with a headache? It might be an indication you have sleep apnea. 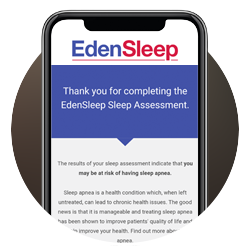 If you find you are often waking up with a headache and having issues sleeping, we recommend you take our online sleep assessment to see if you are at risk of having sleep apnea. It’s time to take your life back and get rid of those frustrating morning headaches. The first step is to take our free online assessment to see whether your symptoms are an indication of sleep apnea. After reviewing your online sleep assessment, we may suggest that you complete a sleep study, which can take place in your own home. During the test, sensors will collect your sleep data, which we can use to determine whether you have sleep apnea. It might sound daunting, but the test is easy and we will help along the whole way. Keep in mind that sleep apnea is common. Plus, the quicker you seek help, the sooner you’ll be started each day off on the right foot. You’ll need to see whether your test results indicate that you do have sleep apnea. At this stage it’s also a good idea to invest some time in aiding your overall health by improving your diet and exercise. Reducing any extra weight can help improve sleep apnea as well as its symptoms. In terms of what you’re eating and drinking, you should try to limit the amount of caffeine that you have and avoid it altogether for at least four hours prior to bedtime. If the tests is positive, this is good news as treating your sleep apnea is likely to get rid of your morning headaches. We can help determine which treatment option is best for you. The gold standard treatment for most people suffering from sleep apnea is CPAP therapy. Don’t let any cost deter you either – it’s must better to get your sleeping problem solved as early as you can identify it, which will also save you on future treatment costs. Research shows that in 2005, the estimated total annual societal costs of sleep apnea among New Zealanders aged between 30 and 60 years old was a staggering $39.8 million. Once your treatments begin you should gradually notice a difference and can look forward to getting the most out of your mornings again. But without your headache alarm waking you up in the early hours, be careful not to sleep in! Complete our free online assessment now.